The geologic record gleans a one-of-a-kind treasure trove of information about climatic change and the interaction between components of the Earth system and life. In certain time periods, even tens or hundreds of millions of years ago, we can assess seasonal variations in temperature and rainfall, or we can measure changes in the ocean circulation and carbon cycle that occurred on time scales as short as 1,000 years. We use climate proxies as signs of these past climatic properties and processes. Some candidates for proxy-hood include physical properties and chemical and isotopic compositions of minerals, and fluids or gases found in the ocean, on land or in glacial ice. Other possibilities include the anatomical or assemblage structures of certain fossil plants and animals, or even their presence or absence in the fossil record of a locality. On land, climatic variables that have been proxies include the mean annual, maximum and minimum, and seasonal distribution of temperature, precipitation and net evaporation. In the ocean, the key variables include currents, temperature, salinity, nutrient availability, productivity and redox chemistry. Biodiversity patterns, continental weathering rates, winds and storms are also the target of proxy analysis. The past three years have been an exciting time for studying Earth’s past climate. Innovations in reconstructing paleoenvironmental history from proxies have been coming fast and furious. High-resolution records with better age control and spatial coverage are supplementing and replacing low-resolution records that have weak time constraints and poor spatial coverage. New proxies have emerged and some tried-and-true proxies have seen new applications. Using these new proxies, scientists have extracted novel information about the climate system. Characterizing a past climate from proxies is like conducting a criminal investigation based solely on forensic evidence — physical principles, deductive logic, assumptions and the systematic elimination of alternative hypotheses all play a critical role. Proxies can be quantitative, yielding essentially precise, although not always accurate, estimates of climatic parameters. Transfer functions use regressions or other statistical methods to calibrate relationships between properties measurable in the geologic record and climate parameters observable today. Using quantitative relationships between leaf properties and modern climate variables, Peter Wilf reported work last year in the GSA Bulletin (vol. 112, p. 292-307) showing that, 53 million years ago in Wyoming, mean annual temperature was 21 ± 2 degrees Celsius and mean annual precipitation was 144 centimeters. Other proxies can be qualitative or semi-quantitative, giving climate estimates based on analogies with conditions today. The presence in Wyoming 53 million years ago of ginger, palms, cycads and hibiscus indicate temperatures were also above freezing year-round (Wing, Scientific American, v. 110, p. 48, 2001). Qualitative proxies can be more difficult to put an exact number to, but the interpretation might be more or less reliable under differing conditions. Both qualitative and quantitative proxies work if the calibration that holds true in the present also held true in the past. In the best cases, modern calibration agrees with some theory derived from first principles or a strong biological or physical constraint. No climate proxy is truly sensitive to only one climate parameter, so the most reliable characterizations of paleoclimates come from multiple proxies — preferably both quantitative and qualitative — for the same climate characteristic. Then it becomes possible to play the weakness of one proxy against the strengths of another and, as a result, to constrain more climatic parameters. Between time periods in which we have only climate proxies and the past 100 years or so of instrumental records are historical records, primitive instrumental records and climate proxies, which are a bridge to reconstruct climate variation over the past millennium. Three teams of researchers have carried out the arduous task of compilation and statistical analysis of databases of important climatic parameters from these records: Briffa et al., Nature, vol. 393, p. 350, 1998; Mann et al., Nature, vol. 392, p. 779, 1998; and Jones et al., vol. 8, p. 445, 1998. We have learned crucial lessons from these synoptic analyses. Oscillations of observable climatic importance today, such as El Niño and the North Atlantic Oscillation, are measurable in climate proxies, such as tropical corals and European tree rings. They make up a large part of the variability in past climate time series. Volcanic eruptions and inferred solar variability also have significant but variable cooling effects that are reflected in historical records of the time — such as 1816, the “year with no summer.” Reporting in the July 14, 2000, Science, Thomas Crowley presented a model driven by proxies for volcanic eruptions and solar variability over the past millennium. His model matched temperature proxies, thus providing a critical line of evidence that models can respond correctly to forcing. In a further extension of the technique of checking climate proxies against independent historical or archaeological records, H.M. Cullen et al. (Geology, vol. 28, p. 379, 2000) found a dramatic increase in dust concentrations in marine cores taken offshore directly downwind of Mesopotamia 4,025 ± 125 years ago. This dust peak indicated a 300-year-long drought in the region, at a date that exactly matched the timing of the fall of one of the great civilizations in the region, the Akkadian Empire. Looking even farther back in time, extending to 12,000 years ago, Harvey Weiss and Raymond S. Bradley have described linkages between high-resolution, deep-sea climate records and archaeological, historical and terrestrial climate records to show that climate changes drove many of the events in early civilization (Science, vol. 291, p. 609). Thus, ample evidence shows not only that proxies for past climates are reasonably correct, but also that the climate changes they record are substantial enough to change human societies and the environment. For several decades, the gold standard for reconstructing climates in the distant past has been the oxygen isotopic composition of the calcite shells of foraminifera, or forams. Importantly this composition depends on a number of factors, including the isotopic composition of the seawater in which a foram grows — a function of changes in global ice volume on land and regional changes in the surface net evaporation balance. As a consequence of this dependence, forams have long been used as an indicator of terrestrial ice-volume changes. Also, the relationship between the seawater isotopic composition and the oxygen isotopic composition of the foram is generally predictable. The problem is that this relationship changes as a function of the light levels and seawater alkalinity under which the forams grow, as well as other factors (Bemis et al., Paleoceanography, vol. 13, p. 150, 1998). Such challenges to unraveling a climate signal from oxygen isotopes in foram calcite are significant, but have not prevented researchers from gathering a wealth of data. For example, James Zachos and his colleagues have created a high-resolution, deep-sea oxygen and carbon isotopic compilation — a 65 million-year record spaced over approximately 20,000-year increments (see a summary of their results in Science, vol. 292, p. 686, 2000). When combined with other proxies and environmental information, the study illustrates the general cooling of the deep ocean from 12 degrees Celsius to slightly below 0 degrees Celsius over the past 65 million years, as well as Milankovich climate oscillations and the rapid transitions that affect the trend. These transitions result from the brief and sudden warming that occurred at the beginning of the Eocene, and from ice sheet movement to the Antarctic at the end of the Eocene. To draw a clearer picture of the temperature signal seen in oxygen isotopes, C.H. Lear and colleagues, reporting in the Jan. 14, 2000, Science, along with others reporting in Nature (Elderfield and Ganssen, vol. 405, p. 442, 2000) used the fact that the magnesium-to-calcium ratio of foram shells is a function of temperature. While the ratio is not necessarily only a function of temperature, the fact that they find substantial differences in the relationship between temperature and the elemental relationship among different foram species could be significant. Still, as no evidence supports the idea that the magnesium-calcium relationship is sensitive to seawater’s isotopic composition, researchers used this independent proxy to unravel the temperature signal oxygen isotopes record from the ice volume and net evaporation signals. This record shows that glaciation in Antarctica began 34 million years ago (earliest Oligocene) and was surprisingly not coincident with a cooling of the deep ocean. Also, the new estimates of tropical sea-surface temperatures during the Last Glacial Maximum are closer to those from other proxies, based on alkenones and faunal abundance data. Thus, the results from these magnesium-calcium analyses are challenging long-held ideas about climate change. 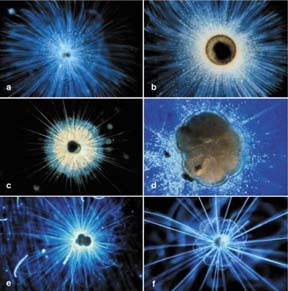 Using similar methods, David W. Lea, Dorothy K. Pak and Howard J. Spero could create a 500,000-year time series of planktonic foram magnesium-to-calcium ratios in the eastern and western Pacific (Science, vol. 289, p. 1719, 2000). This work demonstrated that: glacial tropical sea-surface temperatures were about 3 degrees Celsius cooler than nonglacial values; the east-west gradient in Pacific tropical temperatures was close to modern; the troublesome Devils Hole oxygen isotopic record was in phase with the magnesium-calcium record; and that Antarctic temperature records based on deuterium excess were also synchronous with this tropical Pacific record. The latter two records directly linked the tropical climate with climates outside of the tropics. Elderfield and Lea’s studies open the way for using the difference between the magnesium-to-calcium ratio and oxygen isotopic predictions to delineate changes in seawater composition. Using this technique as a basic proxy for estimating oceanic surface salinity distributions at any time period becomes possible. Currently, no good proxy for this important climate parameter exists. In the very next issue of Science (vol. 289, p. 1897, 2000), Nicholas J. Shackleton used the oxygen isotopes and carbon dioxide trapped in the Antarctic Vostok ice core and the oxygen isotopic ratios recorded by deep-ocean forams to accomplish the seemingly impossible: deconvolving the temperature and ice volume signals in the isotopic record. By precise correlation of records from deep-sea sediment and terrestrial ice, and through a series of plausible but perhaps shaky assumptions, Shackleton established that deep ocean temperature, atmospheric carbon dioxide and orbital eccentricity are in phase; and that, at the same time, continental ice sheet volume lags. Traditional records did not tease out the changes in seawater composition as well. Shackleton’s study is significant in showing that, over the past 500,000 years, carbon dioxide variations drove significant climate variability and the world’s ice sheets responded — not the other way around. The sensitivity of climate to changes in the concentration of greenhouse gases, particularly atmospheric carbon dioxide, is one of the most important issues in understanding past climates and in looking at future climate change. Those of us who are climate modelers are distinctly lucky in that a spate of new, and very different, estimates of atmospheric carbon dioxide on long time scales have been published in the past two years. Researchers have gained new ground in using a variety of proxies, including alkenones, boron isotopes, carbon-13 and even stomata on ginko leaves (see a review of strengths and weaknesses of these methods by Royer, Berner and Beerling, Earth Science Review, vol. 54, p.349, 2001). But even when we consider the weaknesses they outline, it is clear that this is a rapidly evolving area. The concentration of carbon dioxide in the atmosphere, in the ocean and in soils is directly linked to surface climate, ocean pH and productivity, and terrestrial weathering rates, in a complex and still poorly understood set of interactions recently reviewed by Lee R. Kump and colleagues (Annual Review of Earth and Planetary Sciences, vol. 28, p.611, 2000). One source of uncertainty in our understanding of these interactions is in the record of atmospheric carbon dioxide. Equally important is the fact that the long view provided by the proxy data record reveals no consistent picture of how climate responds to changes in carbon dioxide. Veizer, Godderis and Francois created a low resolution time series of tropical oxygen isotopes from a variety of calcitic and aragonitic shells spanning the 550 million years of the Phanerozoic. Surprising to some, the tropical sea-surface temperature record extracted from this time series revealed large swings between 4 and 6 degrees Celsius, and showed that temperature variations in the tropics varied with high latitude climate proxies (based on ice rafted debris), but did not agree with the model-predicted response to reconstructed carbon dioxide variations. The difference between model-predicted tropical temperatures when forced with proxy data-predicted carbon dioxide, and the tropical temperatures reconstructed from oygen isotopes has been a persistent problem, both for cold climates and for warm climates like the Cretaceous and Eocene. Paul Pearson and colleagues (Nature, vol. 413, p. 481, 2001) have just launched a new salvo in the ongoing controversy on this issue, claiming that all existing tropical foram isotopic data from these time periods have been altered in a way to bias them toward cooler values (see also page 9 of this issue). Their study uses foram shells that had been buried in impermeable clay-rich sediments, thus they were not exposed to a flux of water which would shift the isotopic composition. They preserve what Pearson believes to be the real temperature signal of about 31 degrees Celsius, rather than about 24 degrees Celsius. At the present time however, tropical temperature reconstructions predating the Quaternary remain controversial and their relationship to changes in atmospheric carbon dioxide even more so. The methane-driven global carbon-13 isotopic excursion 55 million years ago that ushered in the Eocene allows the correlation of terrestrial and oceanic records. It also enables researchers to establish rates of climate change globally with great precision and to explore how the climate system and carbon cycle respond to a sudden release of a greenhouse gas. In the October 2000 Geology, U. Röhl and co-authors established a detailed chronology of this methane release event by using spectral analysis of high resolution geochemical records from a deep-sea core in the South Atlantic and North Atlantic. They showed not only the carbon excursion and relaxation to normal values, but also the orbital variability that allowed a precise age model to be developed (vol. 28, p. 927). Röhl’s results show that the interval includes 11 precessional cycles yielding a total duration of about 220,000 years and that the initial excursion occurred in two steps, each less than 1,000 years in duration. Evelyn S. Krull and Gregory J. Retallack (GSA Bulletin, vol. 112, p. 1459) analyzed carbon-13 records and suggest that sudden releases of methane also occur across the Permian-Triassic boundary. And Stephen Hesselbo and others have found a similar isotopic spike in fossil wood and the upper ocean in the early Jurassic (Nature, vol. 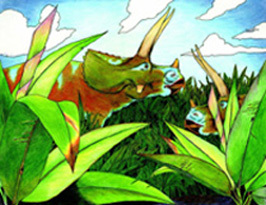 406, p. 392, 2000), while Maureen Padden and co-authors provided evidence that the Late Jurassic also experienced a sudden methane release (Geology, vol. 29, p. 223, 2001). While it’s still too early to say whether these reports will stand the test of time, they may present a unique opportunity for understanding the Earth system, because they afford us the luxury of high-resolution, global correlations and repeated instances of the system’s response to greenhouse gas perturbations. The distributions of cadmium and carbon-13 have long been used as tracers of ocean circulation during the Quaternary and further back in time. Difficulties remain in making reliable predictions from them, especially far back in the geologic record. A suite of proxies rapidly gaining applications are the non-conservative isotopes of strontium, neodymium, lead and hafnium. Derek Vance and Kevin Burton showed that neodymium in planktonic forams accurately record the neodymium composition of seawater and may be a tracer of shifts in weathering from continental source regions and ocean circulation changes, over about 2,000 years (Earth and Planetary Science Letters, vol. 173, p. 365, 1999). At the same time, Ben Reynolds and colleagues showed that ferromanganese crusts from the seafloor provided a lower resolution record extending back 8 million years of the same shifts, with both neodymium and lead isotopes (Earth and Planetary Science Letters, vol. 173, p. 389, 1999). By looking at these isotopes in fish teeth from the seafloor, E.E. Martin and B.A. Haley have corroborated these records and shown that this type of analysis provides interesting results back at least 25 million years (Geochim. Cosmochim. Acta, vol. 64, p. 835, 2000). In further work, A.M. Piotrowski et al. have demonstrated similar abilities from hafnium records, although it is more sensitive to continental weathering rate changes (Earth and Planetary Science Letters, vol. 181, p. 315, 2000). Studies of this type are being used to constrain or estimate weathering rates from continents and to monitor deep ocean flow patterns and oceanic thermohaline circulation changes. Used in conjunction with carbon-13 records, these proxies can give us important information about global carbon cycling. It seems clear that because of the differing residence times of these isotopic tracers, these proxies have quite a future ahead of them for all time scales. Yesterday, cloudy with rain. Tomorrow, cloudy with rain. Some major gaps in our understanding of past and future climate are left by existing proxies. For example, cloud properties and atmospheric composition are poorly characterized by proxies, but that may change in the future. Recently, techniques targeted on understanding the role of sulfur in the climate system have begun to make exciting progress on these issues. Reporting in the Aug. 4, 2000, Science, James Farquhar, Huiming Bao and Mark Thiemens used the existence of so-called mass-independent fractionation of sulfur to estimate when the atmosphere began to have significant quantities of free oxygen. They generated a time series of Precambrian sulfur isotopes from sulfide and sulfate minerals and, by noting that only rocks older than 2.3 billion years contained a mass independent fractionation, they predicted that this marked the beginning of the atmospheric oxygen rise that made complex life possible. This same fractionation, except with oxygen isotopes, has been employed by Bao and others to establish that terrestrial sulfate deposits might be used to monitor very detailed oxidation reactions in Earth’s past. Bao’s team analyzed massive sulphate deposits in the Namib Desert that were derived from biologically produced marine sulphur through oxidation of marine dimethyl sulfide (DMS) (Nature, vol. 406, p. 176, 2000). DMS is a very important mediator of cloud albedo (reflectivity) and has been widely discussed as a potentially large player in biologically mediated climate feedbacks, especially in the Southern Ocean (as summarized by Watson and Liss, Phil. Trans. R. Soc. Lond. B, vol. 353, p. 41, 1998). Anders S. Henriksson et al. have proposed that deep-sea core records from the Equatorial Atlantic of organic biomarker compounds derived from DMS and accumulation rates of DMS producers, such as coccolithophores, are a proxy for DMS over the past 200,000 years (Geology, vol. 28, p. 499, 2000). If they are correct, their results show that clouds may have been more reflective (leading to tropical cooling) during glacial episodes, providing a means to make climate models better match the cooler temperature estimates at the Last Glacial Maximum, for example. If climate researchers can focus and compare the kinds of techniques Bao and Henriksson used, they could develop powerful proxies for past cloudiness. Click here for a list for a full bibliography of articles related to this story. Read what leading climatologists told Geotimes about earth science data. Huber is working as a postdoctoral fellow at the Danish Center for Earth System Science, Niels Bohr Institute in Copenhagen, where he is focusing on paleo- climate modeling. E-mail: rop@dcess.ku.dk.